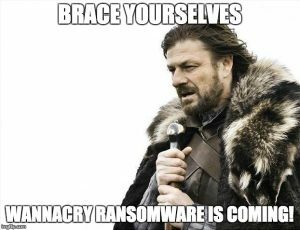 Beware of WannaCry! – Great White North Technology Consulting Inc.
Graphic Design & Your Business: Why is it Important? Say hi to WannaCry! It’s here and takes no unprotected computer for mercy. WannaCry is the latest Cryptoware/Ransomware variant, and it’s out to get your unprotected Windows computers. Once it infects your computer, it spreads like wild fire to the rest of the computers on your network or any network that it’s connected to – Yes, even public wireless hotspots. Yikes! That sounds like a bad way to spend your weekend. Without all the technical details here is what you can do to protect yourself. If you are interested in more technical details, click here. Keep your systems fully up to date with the latest Microsoft and third party patches. Use a reputable antivirus program and make sure it’s automatically updated. Ensure that your antivirus scans your computer regularly on a defined schedule. BACKUP, BACKUP, BACKUP! If all else fails and you end up getting hit, your backups will be your saviour. No Backups + WannaCry = Grown ups crying. We don’t want to see grown ups cry! So backup, backup, backup! If you provide free wifi to your customers you’ll want to make sure that your wireless solution provides guest isolation. I know what you’re thinking here… “I am giving people free internet, now I have to make sure it’s safe for them? !” What does “guest isolation” really mean? Well, it means that each user/device on your shared wireless network can’t see each other or even worse, your network devices like computer, printer and point of sale systems (EEEK!). Our GreatWifi solution is affordable and provides guest isolation to keep your network and guests secure. If you don’t want to worry about this sort of thing on a Saturday morning, we can do it for you. We offer Managed IT Services to businesses across Canada. Our GreatSecurity bundles ensure that YOU are fully protect and updated. To find out more information, contact one of our experts here.